Thor's Pizzeria - Voted Best Pizza in Nelson BC! The Healthiest Pizza in Nelson BC! The King of the Gods' favourite! 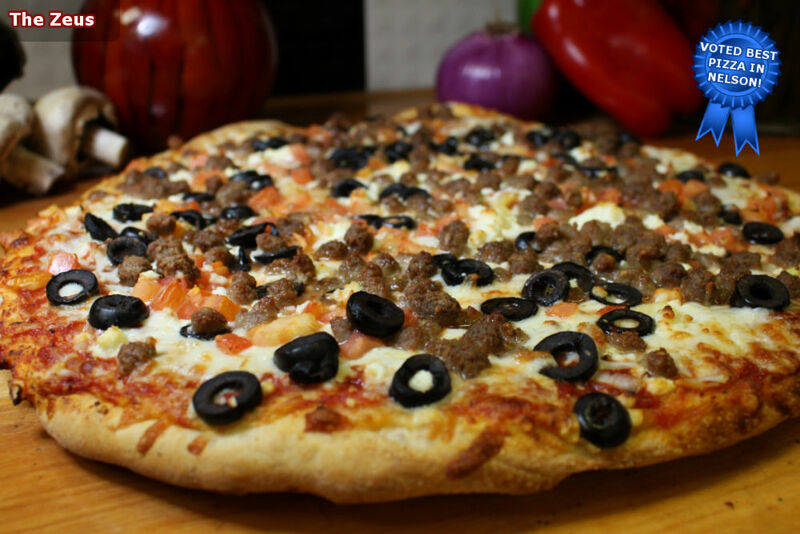 Ground beef, herbed sausage, feta, tomatoes, black olives, onions & Thor's mozza blend. The God of War needs his strength so he demands a meaty pizza. Ham, pepperoni, salami, bacon, herbed sausage and Thor's cheddar/mozza cheese blend. This one’s hot as Hades! Spicy capicolli, spicy pepperoni, jalapenos, banana peppers and fresh roasted garlic with Thor's cheddar/mozza cheese blend. Naturally, the God of the Sea would love our Hawaiian pizza! 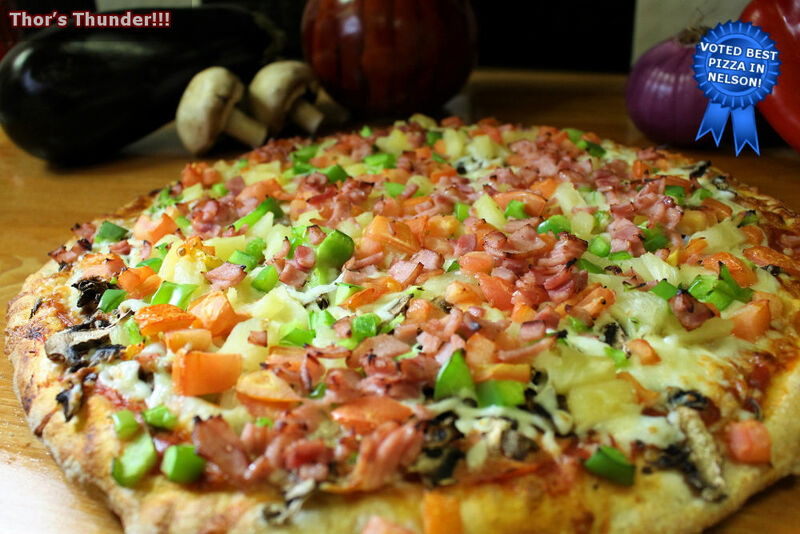 Ham, pineapple, bacon and Thor’s cheddar/mozza cheese blend on our tangy smokey pizza sauce. The daddy of all Norse Gods hankers for that BBQ flavour! Apple-smoked chicken, bacon, onions, red peppers and Thor's mozza blend on our smokey pizza sauce with tangy BBQ sauce drizzled on top. The God of Wine needs cheese! This one has it all —Feta, Thor's cheddar/mozza blend, parmesan & provolone. Venus "loves" this one... fresh spinach leaves, feta, black olives, onions, tomatoes, fresh roasted garlic and Thor's mozza cheese blend. The God of Sun loves to see his garden on his favourite pizza! Green peppers, red peppers, mushrooms, onions, tomatoes, fresh roasted garlic & Thor's mozza blend. The Goddess of Beauty insists on this beautiful pizza. 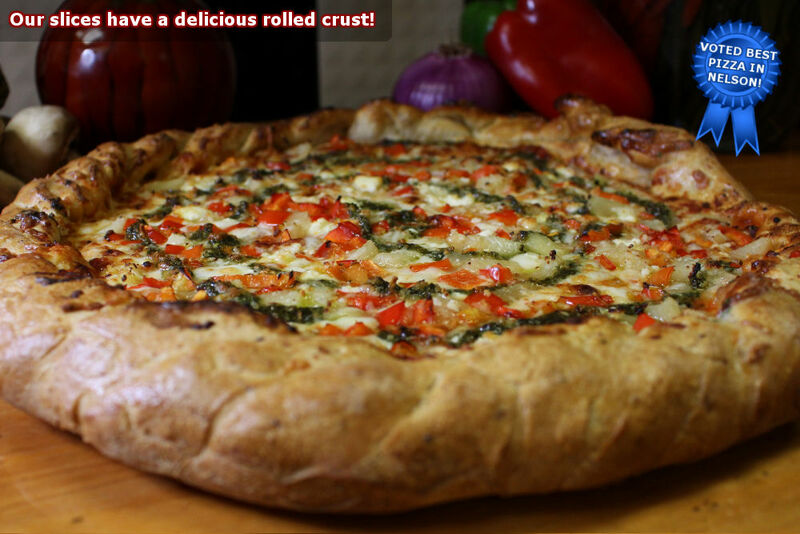 It has sun-dried tomatoes, red peppers, red onions, fresh spinach, fresh roasted garlic, parmesan and Thor's mozza blend on a bed of salsa. The Goddess of Wisdom has figured out how to have a veggie pizza that's meaty too! Meat-free pepperoni, mushrooms, green peppers, onions & Thor's mozza cheese blend. This one is specially made for the Goddess of the Harvest! mushrooms, artichoke hearts, red onions, green olives, red peppers, fresh roasted garlic and Thor's mozza blend on a creamy sun-dried tomato infused Alfredo sauce. Roasted eggplant, artichoke hearts, tomatoes, red onions, black olives, fresh roasted garlic and Thor's mozza cheese blend drizzled with extra virgin olive oil. The Queen of the Gods has very refined taste. Her favourite has apple-smoked chicken breast, sun-dried tomatoes, red peppers, onions, fresh roasted garlic, parmesan and Thor’s mozza blend all on a bed of Thor's pesto. 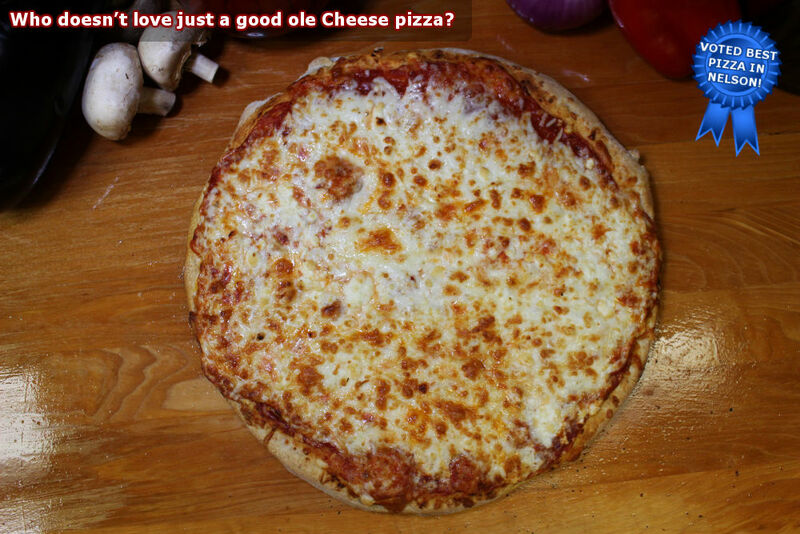 The Moon Goddess moons over this pizza all the time! Apple-smoked chicken, fresh roasted garlic, black pepper, mushrooms, onions, parmesan, and Thor's mozza blend on a creamy sun-dried tomato infused Alfredo sauce. Loki’s mischievous nature likes things a little spicy… apple-smoked chicken, pineapple, red onions, green peppers & Thor’s mozza blend on a spicy/sweet Red Thai Sauce. Being a messenger to the Gods calls for a hearty pizza! Spicy pepperoni, spicy capicolli, black olives, green peppers, red onions, mushrooms & Thor’s mozza blend. The Big Guy likes a big pizza! Spicy pepperoni, ham, mushrooms, green peppers, pineapple, tomatoes, onions & Thor's mozza blend. Hades' angry bride likes it a bit hot — ground beef, black olives, tomatoes, green peppers, onions, jalapenos and Thor's own cheddar/mozza cheese blend all on a bed of chunky salsa. Follow these easy steps to build your own masterpiece! Thor’s Pizza Sauce, Thor’s Smokey Sauce, Pesto, Sun-dried Tomato Infused Alfredo Sauce, Salsa, or Garlic Infused Olive Oil. Extra cheese? Less cheese? No cheese? Multiples of two are more economical. Pizzas do not have to be identical to get the 2 for 1 pricing. Call us at 250-352-1212 to place your order! Marinara sauce, Sliced tomatoes, Bocconcini, Parmesan, Garlic, Basil. Peppercorn ranch, Mozza, 3rd degree chicken, Red onions, Blue cheese. Red Thai sauce, Mozza, Chicken, Red onions, Goat cheese, Crushed peanuts. Garlic spread, Artichokes, Roasted red peppers, Roasted eggplant, Bocconcini, Parmesan, Fresh basil. 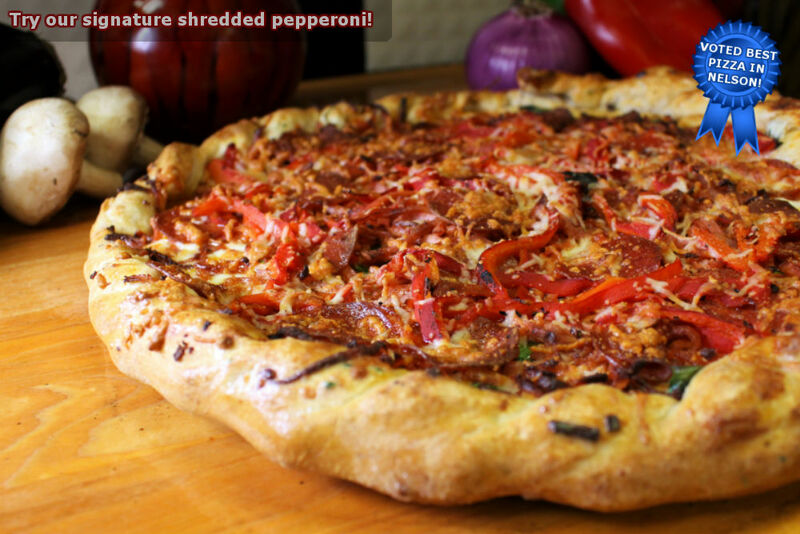 Marinara sauce, Mozza, Sliced sausage, Green peppers, Red onions, Garlic. Marinara sauce, Air-dried pepperoni, Bocconcini, Basil. Ciabattas - Our sandwiches are made on a crusty Italian Ciabatta bun (7 1/2") topped with classic deli meats, real cheeses (not processed) and fresh veggies. We then oven toast them to perfection for a flavour explosion you'll crave for only $7.15! Genoa salami, honey ham, capicolli, green olives, black olives, red onions, pepperoncinis & Provolone cheese. Spicy Italian sausage with Thor's fresh marinara sauce topped with caramelized onions and bell peppers. Add cheese $1.00. Honey ham, smoked chicken breast, bacon, tomatoes, red onions and Provolone cheese. Thor's pesto, roasted red peppers, marinated mushrooms, roasted eggplant, artichoke hearts, red onions and Provolone cheese. Authentic Italian meatballs in our own marinara sauce topped with caramelized onions and Thor's mozza cheese blend. Smoked chicken breast, green & red peppers, red onions and provolone cheese. Paninis are traditional Italian grilled sandwiches. We load the panini bread with all the toppings and then grill the sandwich in a special 2-sided panini grill resulting in a crusty shell with soft, warm insides. You'll think you've taken a quick trip to Europe for only $7.15! Cream cheese, black olives, green olives, honey ham, tomatoes, extra virgin olive oil and feta cheese. Thor's pesto, smoked chicken breast, roasted red peppers and Brie cheese. Cream cheese, Genoa salami, capicoli, red onions, roasted red peppers and Provolone cheese. Cream cheese, red onions, roasted eggplant, marinated mushrooms, roasted red peppers, artichoke hearts and Provolone cheese. A calzone is like a baked pizza pocket. You can enjoy one of our ready-to-eat ones anytime or you can create your own masterpiece. Just pick your sauce, cheese and 4 other toppings and let us do the rest. You’re in for a treat. In 2001, we came to Nelson from Strathmore, Alberta for a change of view. We moved here in mid-September and by October 1st, we opened up our new business – THOR’S PIZZA. 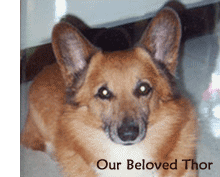 We named it Thor’s after our beloved dog at the time. Thor is no longer with us, but he will live on in our pizzeria as well as our hearts. We figured that with Chris’s background as a chef de cuisine and my background in marketing and administration, we should be able to cover all the bases of the restaurant. It was a lot of hard work and long hours, but it’s paid off because we’ve seen the business grow steadily ever since. Our goal has always been to become part of the fabric of Nelson. We had visited the town several times before moving and we really sensed that Nelson was different than other towns of its size. 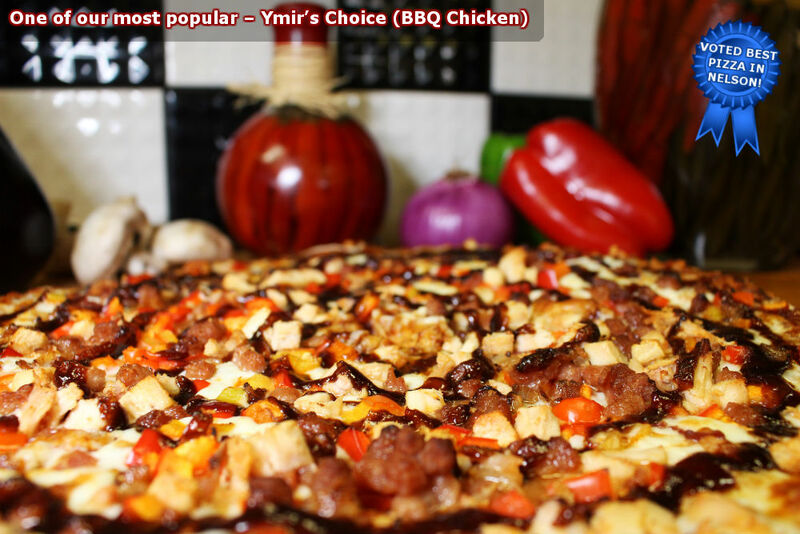 For that reason, we felt that we could make a success out of a pizzeria that was different from other pizzerias as well. The combination of Chris’ background and the fact that we were not a franchise meant that we could really tailor our offerings to the needs and wants of the Nelson crowd. That’s exactly what we have done over the years. 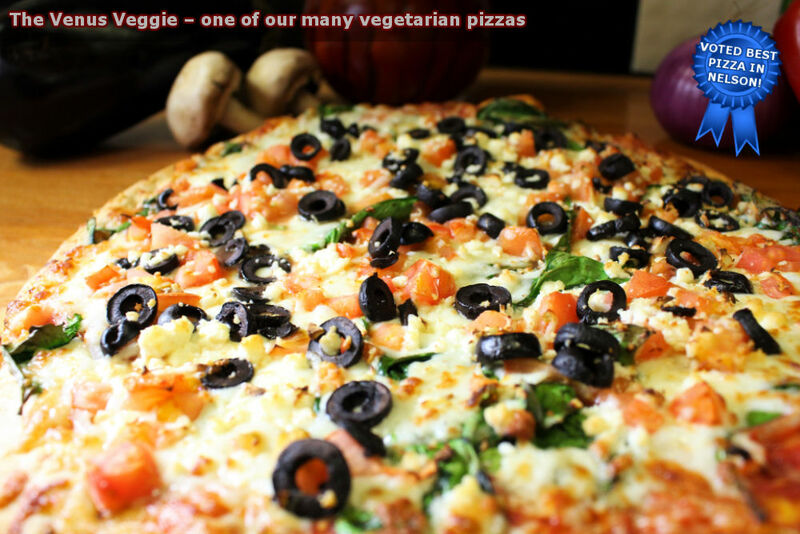 For example, a full 1/3 of our pizza menu is vegetarian. It didn’t start out that way, but we recognized the popularity of these choices over time so that section of the menu grew and continues to grow. We make our dough and our sauce from scratch and use ingredients like extra virgin olive oil in both. Most pizza places use canola oil as olive oil is 10 times the price or more. But everyone knows that olive oil imparts a wonderful flavour and body to food (plus it’s healthier!). Making our own sauce means a great tasting pizza base that isn’t loaded with salt like canned sauces are. We grate and blend our own cheese, smoke our own chicken, slice our own meats, and chop our own veggies. Does this mean more expense and labour? Yes, but knowing that we have fresh, healthy pizza that we can take pride in makes it all worthwhile. When we hear that people think we have the best pizza in town (we always knew that, but it was confirmed in 2009 in the Nelson Daily News reader poll!) we know that we are doing the right thing. And we do all this while keeping our prices competitive with pizza chains so that families and individuals can enjoy our food without having to sacrifice anything. We have changed, expanded and refined our menu (and our floor space too!) over the years – we’ve added grilled paninis, toasted ciabatta subs, pasta bowls, flatbreads and sweets just to name a few and we’ll continue to seek out new ideas or new ways of doing things. That’s the advantage of being who we are and where we are. We can change things up anytime we want and Nelsonites are open enough to try them along with us!